~ An educational and philosophical look at nature - sometimes with humor! 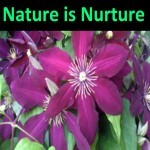 | An educational and philosophical look at nature – sometimes with humor! ~ An educational and philosophical look at nature - sometimes with humor! My husband and I finally found a hardy plant for our large centerpiece terracotta pot that is both beautiful in bloom and also when not – African Iris. We live in Hardiness Zone 8a which means our temps can dip down into the teens in the winter, although this doesn’t happen often. Zone 8a is likely the northernmost zone African Iris, or Dietes, can grow as a perennial. In fact, we are fortunate our particular plant is doing so well since it is situated in a pot. I have found most plants fare much better when, on the cusp of their hardiness zone, they are placed in ground versus in a planter. However, I inherited a large number of planters when I married, so I am content to fill them! And, I am ecstatic to fill them with an evergreen perennials that withstand icy cold nights as well as 100 degree summer days! As the title of this post mentions, African Iris is an attractive plant when in bloom and when not. It is sometimes called a Fortnight Lily because the plant will flower consecutively for a couple of weeks and then rest a couple of weeks before another stalk of blooms forms. If you look closely at the picture above, you’ll see pods from spent blooms on the same stalk with the flower that is blooming. Blooms of the African Iris are small (about 3 inches), dainty and ornate. Depending on the variety, orange, yellow, blue or a combination of these accent colors, will form against crisp white petals. I believe my African Iris pictured in this post is of the “Orange Drop” variety as it is completely devoid of blue. If you look up African Iris, or Dietes, you’ll see some varieties have a bit more color to their flowers than mine. Although its individual blooms are open for only a day or two, the African Iris has a very long blooming period in north Texas. It will flower off and on from late spring to early fall in north Texas and will bloom more abundantly if placed in a sunny location. The stalks of the plant can grow 3 – 4 feet tall with an even larger spread, so be sure to plan for room for growth and good air circulation. African Iris grows from rhizomes, and like most plants of this type, it should be divided if crowding occurs. In addition to enjoying full to part shade, the plant likes well-drained soil and is quite drought tolerant once established. Some people enjoy planting their African Irises near water features and this is perfectly fine as long as the plants do not sit in water. Root rot can occur if drainage isn’t good but other than that, the plant is relatively disease and pest free. I actually consider the small blooms of the African Iris a bonus because it is the plant’s foliage that truly serves my landscape well. The long, green, sword-like blades are reminiscent of fanning ornamental grass. Other than discontinuing to bloom, the plant stays in very good form throughout the cold months, providing for a pop of greenery in a typically barren, winter garden space. If you happen to live in colder climates than Zone 8a, you can certainly enjoy African Iris as well. You may wish to plant it in pots that are small enough to move indoors during the winter or plant outdoors and cover, along with other tenders, when a hard freeze is predicted. I’ve also read where a person can go to the trouble of digging up the rhizomes in the fall, bringing them inside and replanting them when the soil warms in the spring. If, like me, you reside on the cusp of their hardy zone, you may chose to keep the plant outside and strive to protect it during hard freezes, knowing that you may have to clip a few brown freeze-burned blades come spring. Speaking of clipping blades, it is fine to “cut back” African Irises in early spring. This is not necessary, but can provide for a fresh look if, after a couple of years, you are seeing a few bent, brown or yellow blades here and there. I sort of look at this as similar to tidying up Liriope ( https://natureisnurture.net/got-the-blues/ ) and other perennial lily turf “grasses”. In closing, I hope when looking around garden centers and nurseries this spring that you come across this not-so-common plant and give it a try. I think you will grow fond of it’s ease and simplictic beauty. Last weekend was a time for raptors at my suburban north Texas home. First of all, I unintentionally attracted a Cooper’s Hawk to my fence on Saturday. I had refilled my bird feeder with fresh seed that morning. Although I have my bird feeder situated in a rather protected area between my house and my neighbor’s, of course, hawks have incredible eyesight so the little sparrows, warblers and juncos fluttering about that morning definitely lured the predator in. Fortunately, the hawk left without a meal from my feeder. Later that evening, as my husband and I returned home from a family visit, we noticed a spherical ball of fur lying on the stonework in our front yard. Granted, we have problems with mice from time to time as do most of us in the north Texas area, so at first glance, I thought the ball of fur was a curled up, deceased mouse. Upon closer inspection, it became apparent the egg-shaped item was an owl pellet. I had heard of these pellets before but I had never come across one personally. **Before you read on, do not do so at the dinner table . . . save this post for a time you are not eating! Raptors typically swallow their prey whole or in large pieces. Unlike most birds, these birds of prey do not have a storage place or “crop” in their digestive system that allows for the slow and complete digestion of fur, bones, feathers, shells, etc. Thus, the indigestible parts of mice, small birds, reptiles and insects must be expelled by the raptor to make room for it to comfortably eat again. These indigestible items meld together to form what is called a pellet. Pellets are typically expelled 6 – 10 hours after a raptor has eaten prey. It’s not a pleasant thought, but I sort of envision this process as the same as a cat coughing up a hairball. The size of the pellet I found in my yard was bigger than a large hen egg. Because of its size, I’m quite certain it originated from an owl – probably one of the larger species found in our area such as the Great Horned Owl, Barn Owl or Barred Owl. I’ve indeed heard the soothing sound of a Great Horned Owl once or twice in the night over the past few months, and, I’ve noticed we do not seem to have evidence of as many rodent visitors to our sun room as we’ve had in the recent past. I suspect the owl is getting its fill! In fact, I’m sure the pellet I found last weekend was comprised of a mouse. I had posted about my find on social media and learned that oftentimes elementary school children dissect owl pellets in science class these days. As my curiosity grew, I decided to retrieve the pellet from my yard and dissect it. It had been raining when I found it so I had left it on the stone outdoors. The pellet was much harder to dissect than I expected. The hair was tangled, matted and wrapped very tightly around some of the small bones. The hair was wound so tightly that I finally lost patience in trying to untangle it. I ended up carefully cutting the hair with scissors and slowly pulling the item apart. I found a couple of jaw bones with teeth intact and what I believe to be a portions of a tiny skull. There were many other small bones that I couldn’t quite identify. After comparing my pellet picture with those I found online, as unbelievable as it is, I think the very curved bone in the bottom right of my pic below is an overgrown mouse incisor! The tooth is much larger than I would’ve ever thought for such a small mammal. I understand dissecting an owl pellet can be considered morbid but for me it was an extremely fascinating and educational activity. I’m probably a rare individual in that although I am very aware of their unsavory habits, mice and rats do not scare or disgust me. This doesn’t mean I welcome them into my home! In fact, I’m grateful for the natural predators in my suburban neighborhood that keep them in check. I suppose my statement earlier about it being fortunate the Cooper’s Hawk did not capture the warbler may be a little biased in the world of predator vs prey, especially when I am always rooting for the owl to catch the mouse. However, rest assured, nature does not discriminate. Robins are well-known for eating worms. They are the early bird in the adage, the early bird gets the worm. However, robins eat a variety of insects in addition to worms – as do most birds of the thrush family. Perhaps these eating habits are the reason we associate robins with impending spring. We are accustomed to seeing them search for worms & insects in the ground – worms and insects that are much more abundant as our soil begins to warm. While it is true a robin’s diet is primarily made up of invertebrates, when the weather is cold and worms and insects are scarce, a robin will consume winter fruit and berries. Oftentimes, they travel in large flocks from one fruit-bearing tree to another. I have to admit, I was a little surprised to learn about this herbivorous aspect of a robin’s diet. All along, I thought it was solely cedar waxwings that perched in our trees during the winter, consuming berries and tender buds. It wasn’t until I witnessed dozens of robins in our pear and elm trees this past week that I realized the waxwings had competitors. Most of the robins atop appeared full and satisfied with their winter vegetarian cuisine and stayed roosted. However, a few of them flew down and attempted to find an errant bug or two in the cold mulch. As an aside, I read that having a flock of robins in your trees doesn’t mean they are only eating fruit and berries. They could be performing a bit of needed pest control on your behalf. Using their keen eyesight typically reserved for spying worms, robins are easily able to find hibernating insects in tree bark and rolled leaves. While a robin’s diet is quite varied, they are rarely seen perched at bird feeders that are strictly filled with seed. If you’d like to attract them to a feeder you should purchase a fruit mix or add a little fruit of your own to the seed. And, in addition to planting berry-bearing shrubs, another sure way to attract robins to your yard is to install a bird bath. In my experience, robins are not shy about using a bird bath with their seed-loving cousins and, of course, fresh water is a year round requirement! To sum up, I suppose the more accurate “spring is coming” sign for north Texans is: When you see robins transition from tree feeding to ground feeding you can reasonably expect the earth is warming and spring is approaching. I wasn’t planning on focusing this post on robins, but as I write usually one subject comes to the forefront. I would like to conclude that while walking my dog this weekend I witnessed a couple of other signs of impending spring in my area. A bright yellow forsythia had begun to bloom and a single red flower was peeking through a heavily mulched ice plant. I also noticed the garlic chives had sprouted in my herb garden. Although a bitter cold front is on its way to north Texas as I complete this post tonight, I’m still assured spring weather is indeed on its way. In the meantime, I’ll be keeping an eye on how many robins I begin to see . . . on the ground! This post is an excerpt of an article I wrote about nine years ago and I cannot believe I haven’t posted it at Nature is Nurture before now. I suppose the theme is a little more paranormal than horticultural, but since the story references the Super Bowl and includes roses – the flower associated with Valentine’s Day – I find the timing appropriate to share nonetheless. In February, 2010, my husband, Mike, and I took an impromptu road trip to West Texas. We stayed at Indian Lodge in Davis Mountains State Park near the community of Fort Davis. Indian Lodge is an old (circa 1935), but nicely renovated, pueblo-style structure nestled in the Davis Mountains. Before arriving at the state park, we had driven through a beautiful, but desolate, area called “Wild Rose Pass”. It was mountainous and rocky, not unlike the rest of the desert terrain in the area. I mentioned something about the odd name of the pass to Mike as we drove through it, concluding that perhaps, as unlikely as it seemed, wild roses must grow around there in the spring. The next day, we visited the McDonald Observatory telescopes located atop a couple of high peaks near the state park. On the way back down the mountains, we stopped at a picnic site that overlooked a valley. It was a stunningly clear day and the temperature was in the 60’s. While I was preparing a sandwich, Mike mentioned he saw a flower in the distance that looked like it was blooming from a shrub. Being the plant person that I am, he asked if I knew of a “bush” that would produce such a flower. I looked up and gazed intently at the white flower. It appeared to be a rose, but I could not believe it was blooming in the desert, let alone in February! My curiosity piqued, I grabbed the binoculars. Ah ha. . . the flower was not real. I could see the long, false stem of the fake rose winding around the narrow trunk of the scrub tree. As I scanned more of the area through the binoculars, it became clear there were several other shrubs in the ravine that were also adorned with white roses. Some of the flowers had white ribbons attached that were dancing in the wind. We concluded that high school kids may have placed the single bouquets on the trees (football mums?) or perhaps bereaved families had attached them to serve as memorials to loved ones who had met their demise on the steep, winding mountain roadway. Late that afternoon, while back at the lodge watching the Super Bowl game, Mike and I were sitting on opposite sides of the hotel room when the newly installed TV spontaneously went off. We both quickly assumed the other had turned it off (how dare someone turn off the Super Bowl?!) But no – the remote was located in the center of the bed and was nowhere near either of us. I reached over and successfully turned the TV back on as Mike laughed and stated the ghost of an Indian Chief had probably become tired of the rowdy noise. After all, he said, we were staying in an Indian lodge. Ha ha . . .
That night, I left the bathroom light on and cracked the door a little so that neither of us would trip over furniture should we awake before dawn. For those of you unfamiliar with West Texas, the nights are pitch black – especially when there is no moon. (Thus, the reason the area was selected for an observatory.) As luck would have it, in the middle of the night I awoke. I could not see a thing in front of my face – not even the shadow of my hand. Panic setting in, I jumped up and moved the curtains away from the window to see if I could at least glimpse some form of light outside. Whew . . . fortunately my eyes adjusted to a faint light in the parking lot. But . . . what had happened to the bathroom light? Heart still racing, I looked around the room again and the light was definitely off. I then recalled Mike’s comment about the Indian ghost so I decided to cover my head, close my eyes, and go back to sleep! Well, despite the minor electrical issues we encountered, we had an absolutely magical time in West Texas, taking in acres and acres of beautiful scenery and observing multitudes of wildlife, including javelinas, deer, auodads (ram-looking, mountain sheep), foxes and a variety of colorful birds. He told me he had seen the town featured on one of the ghost-hunting or travel shows recently. He couldn’t remember exactly what the ghost story was about, however. You’ll recall I mentioned we went through an area northeast of Fort Davis called “Wild Rose Pass”? Well, it turns out back in the day (1850-1860’s) there was a rumor that wild white roses grew along Limpia Creek in the high desert area. The young wife of a lieutenant stationed at Fort Davis was homesick for the flowers of her home state, Alabama, and decided to venture out beyond the safe boundaries of the fort, looking for the fabled roses. She never returned. It was commonly known that Apaches watered their horses at Limpia Creek and the fort residents assumed the young woman had met her death at the hands of the Indians. Her name was Alice. From there, the story goes . . .
From time to time after her disappearance, new soldiers stationed at Fort Davis would report seeing a beautiful young woman strolling along the fort grounds. When they inquired about the woman to long-time soldiers, she was always described as wearing the same clothing Alice had worn the day she disappeared. And, even more eerie, white roses would spontaneously appear throughout the fort during a sighting of Alice! As I read the ghost story, a chill ran down my spine as I processed the connection of Alice to our experiences – the fake flowers we spotted on a nearby hillside and the multiple electrical outages at Indian Lodge that night. However, as haunting as it sounds, I think the tale depicts the fascinating lore and lure of West Texas. Alice’s deep longing and determination to pick wild roses, despite knowing the intense danger of doing so, speaks to our human desire to seek out the beauty of nature. And – it adds even more flavor to my extraordinary February weekend in the Davis Mountains. Some day I hope you have the opportunity to experience West Texas as I did. I actually hope to visit West Texas again soon and be able to deliver additional photos and information (and maybe another ghost story!) In the meantime, I, again, highly encourage you to visit the community of Fort Davis if you ever have the opportunity. There is so much to experience in the area – far more than I can elaborate upon in this paragraph – but a few key places are: Davis Mountains State Park, Fort Davis National Historic Site, McDonald Observatory and the nearby City of Marfa. As the saying goes, one is never too old to learn something new. On this past Christmas Day, my husband and I were having a quiet, relaxed morning before we would be off to relatives’ homes in the afternoon. As I lazily went back into the spare bedroom with my coffee to snuggle with my dog and cat, my husband and I heard a ruckus outside. It was a little after dawn and, on Christmas morning, it was especially quiet in our suburban neighborhood up until this ruckus began. Looking out the window of the bedroom, I saw there were 10 – 12 crows in the large American Elm of our front yard. The birds were flapping their wings and cawing extremely loud. Some of the birds were flying from our tree to our neighbor’s and back. I quickly called out to my husband as the large cat slowly crossed in front of our glass storm door and onto the other side of our home, finally taking cover from the crows in our neighbor’s shrubs. Although the birds could no longer dive bomb the large cat, they continued to follow its path along our suburban street until their caws finally faded in the distance. Unfortunately my husband did not catch a glimpse of the bobcat on Christmas Day, but the cat (or another) was back the following day at which time he did witness it. The second day, there were no crows around but the bobcat exhibited the same slinky behavior of hugging the side of our home – this time crossing the street and resuming its hugging behavior along the side of our across-the-street neighbor’s home. To first address my immediate concern – the well-being of my pets – I’ll preface this next section by saying that there are many different opinions about bobcat behaviors (and coyote behaviors) in the suburbs. As for us, with a Shih Tzu and a bright, white housecat that both formerly enjoyed the freedom of an unmonitored doggie door, we’ve now become supervisors to our pets’ outings – just to be safe. I’ve read that a bobcat usually doesn’t bother with prey that is at least half its own size. I’ve read that bobcats avoid human interaction – unless rabid. I’ve been told there are plenty of squirrels, rabbits and rats to catch in our neighborhood and that my dog would be too much of a hassle for a bobcat to pursue. Yet – knowing what I know now and knowing that my domesticated dog will likely not be afraid of the bobcat nor will my domesticated cat have a chance in a catfight, I choose to err on the side of caution. I don’t begrudge the wild animals that are appearing more regularly in my neighborhood – they are indeed adjusting to the growth and development occurring in north Texas just as we humans are. As poly-anna as it may seem, I hope we all learn to co-exist peacefully. Back to crows . . . after my husband and I settled in on a plan to safeguard our pets from the big cats, my curious mind went back to the incident involving the crows on Christmas morning. I performed a little internet research and discovered the behavior the crows were exhibiting actually has a name – mobbing. Mobbing is a loud shrieking and diving behavior that some birds exhibit when a predator is near – it serves as a distraction to the predator from finding eggs or fledglings and/or it serves to warn other birds that a predator is on the prowl. Interestingly, mobbing attracts more birds to join in as the behavior continues – even birds of different species will “mob” together. Keep in mind, hawks and owls are considered predators and are on the receiving end of mobbing. Most times, mobbing is successful at running off the predator or at least providing fair warning to susceptible prey. It certainly got my attention on Christmas morning! Having relatives that live/lived in “the country” I was aware that guinea fowl are oftentimes kept on farms to, in-part, alert livestock of an approaching predator. I simply didn’t think the behavior was also present in crows. But – as I continued to research, I learned that blue jays are in the same bird “family” (Corvidae) as crows. Then, it all came together and made sense to me. I recalled blue jays would consistently dive-bomb my housecats when I was a kid. And, I was personally aware they would mob humans as well as pets. I once attempted to save a fledgling blue jay from being run over on a street in my neighborhood. A couple of head pecks and many pulled out hairs later, I was able to get the little one to safety inside a wrought iron fenced yard. Of course, I understood the parent birds thought I was more of a threat than the passing cars but, for the record, blue jays have incredible persistence (as I suspect do crows) in protecting their young! Incidentally, the Corvidae family of birds (which includes ravens and magpies as well as blue jays and crows) is considered to be one of the most intelligent groups of birds, second only to parrots. I once read an article about a man who stopped at a roadside park one day to break up a very long car trip. As he sat at a picnic table, a crow flew in and perched next to him and proceeded to speak. The traveler thought he was hallucinating due to his exhausted state, but he wasn’t. Crows can indeed be taught to speak, perform tasks and they remember human faces. And, as my story goes, they can also serve as a very accurate warning system! All pictures above are licensed through Bing commons. Hopefully I am writing this post just in time (for those of you in my part of North Texas) to serve as a reminder to bring indoors, or at least heavily cover, your citrus, tropicals and other freeze-sensitive plants before the weekend. You would think we would have done this task by mid-November, but in my part of the country temps fluctuate so drastically in the winter most of us simply wait for the night a frost is forecasted before taking such measures. Speaking for myself, this lends to me covering and uncovering and rolling in and rolling out plants sometimes on day after day basis. However, this week’s upcoming forecast shows the temps will dip below freezing and stay there for several nights so I may as well bite the bullet and bring my sensitives into the sun room to stay for a while. One of the plants I will be “rolling” indoors tonight is my lime tree. I don’t look forward to this for many reasons but mostly because my Persian lime variety has quite a few thorns! Although I titled this post “late limes” and mine are indeed maturing later than usual, it truly isn’t late for limes to be hanging on the tree in November. I discovered this many years ago when, on one rare occasion, I traveled to Florida for Christmas. Oranges and grapefruits were still on the trees, just getting ready for picking. Depending on your climate, limes can mature at just about any time of year, but usually they do so between August and December. The variety of lime tree also determines maturity times. In the US, the most common lime tree grown is the Persian – the type I have. A Persian lime tree produces the large (2 1/2 inch), green-skinned fruit that we typically see in grocery stores. The second most popular variety is the Mexican lime (also known as Key lime). The fruit of the Mexican or Key lime is smaller (1 3/4 inch), rounder, and more yellow-green than the Persian and it can also be a bit more sour in flavor. There are several other, perhaps more exotic, varieties of lime trees available, including the Kaffir which produces a bumpy-skinned green fruit. Keep in mind, if you live north of Zone 9 (basically anywhere north of the subtropical zones of the US, i.e., Southern California, South Texas and Central Florida) you will need to follow the “potting” tips below. Plant or pot in full sun. It is best to use potting soil specific to citrus. It is best to use fertilizer specific for citrus and the leaf spray and liquid forms are preferred. Do not over water your tree, even during the hot summertime. When you do water – every 4-5 days maximum – water abundantly. Don’t be afraid to soak the soil/pot. Plant or pot with good drainage in mind. Using citrus soil is helpful, especially if potting. Most lime trees have thorns so handle them carefully and harvest with this in mind! Fully mature limes are yellow like lemons, but they are incredibly bitter at this stage and, thus, are generally harvested when light green (Persian) or just when a little yellow appears on the skin (Mexican). If you don’t harvest many fruit, don’t fret as the leaves of your lime tree are just as valuable and can add delicious flavor to soups, teas and cold drinks. If your fruit drops immature, you can also salvage it for zest. And, as a last resort, the tree itself is simply a beautiful addition to a landscape or patio. Although it is not recommended to freeze limes, I do so anyway. They may not be as luscious as when they are fresh, but the frozen pieces become just as flavorful when added to soups, cold drinks, and beer. If you have to bring your potted tree indoors for the winter, keep watch for those pesky indoor pests such as mealy bugs and scale. If you see them, lightly spray the trunk (and leaves if necessary) with Neem oil. Lastly, lime blooms have the intoxicating aroma of gardenias! A lime tree will attract many pollinators to it (and surrounding plants) when outside and if it happens to bloom a little when you are overwintering it indoors – bonus! I hope the above tips are handy or confirming for those of you with lime trees. If you’ve been on the fence about obtaining a lime (lemon, orange or other citrus) tree, I hope you will consider moving forward. The rewards are many, even if the fruit is a little late now and then! A Squirrel? A Bird? No, it’s a Frog! If you’d rather not do that, invest in a portable A/C (about $300) to cool down to a tolerable level at least one room in your house. Three hundred dollars is not small change, but consider it an investment that you can use again, if necessary, or lend out to friends and relatives who may be in need in the future. Actually, I’ve since learned some folks use these units regularly to keep one room in their house, usually their bedroom, a little cooler at night than others. If you don’t have the funds for either above, find willing relatives, friends or neighbors to put you up. Extreme temps can be deadly! Let me take a side moment to bless those repairmen. In our neighborhood, they start at 6 a.m. and take many breaks, thank goodness, but I honestly don’t know how they continue on once 10 a.m. rolls by. Back to our decision to opt for #2, we also have an escape-artist dog and a scared-y cat. Packing up and going to a hotel with our “special” pets would cause 10 times the stress than all four of us creatures staying home and living in a 11 X 11 room! And for those of you thinking we could go to a hotel and leave our pets at home, please read on to better gauge that thought . . .
You will lose 5 lbs in one day. All water weight, but . . .
Because of above, you learn to love Gatorade even if you previously hated it. Ice cold beer = big fat ankles. You don’t turn on lights in the house. An “open blinds” person must adapt to being a “closed blinds” person. This is why my pics look as though they are in black and white. Your cat will suddenly become claustrophobic when you close the door to the one cool room in the house. If you don’t let her out, your claustrophobic cat will threaten to disengage the portable A/C’s exhaust coil from the window after you and your husband spent 2 hours trying to puzzle it together. When tossed outside the cool room for a brief potty break, your cat will find the second coolest spot in the house – the bathroom tile. I admit, I tested the tile myself and it was indeed cool – just not at all comfortable. Speaking of bathrooms, there is no such thing as taking a quick, cold shower. Your tap water is lukewarm. Your face cream is hot. Your toothpaste is hot. Putting on make-up is an act of futility. Blow drying one’s hair is not going to happen. Thus, be prepared for being asked at fast food joints if you qualify for the senior discount – ugh! On the positive, underwear will dry in 5 minutes when placed outside. On the negative, underwire bras will literally brand you if you don’t let them cool down. All the ice in your refrigerator’s ice-maker will meld together if you leave the freezer open more than 30 seconds, rendering your ice-dispenser useless. Coffee grounds left in your coffeemaker will mold in less than one day, however you stop making coffee because it is unbearable to drink anyway. You entertain the thought of cooking dinner on the stove top at least one night because you are subscribed to a mail order meal plan and you don’t want it to go to waste. Luckily, over a month ago, you picked grilled chicken salad for this particular week. But, you see flies around the delivered box that is resting on your porch when you arrive home from work. The box is supposed to be safe for 24 – 48 hours upon delivery but then again, this is July – in Texas – and it is 109 degrees outside. The 4 ice packs are no longer frozen, the lettuce is wilted and the chicken has completely thawed. You realize there is no way you are eating anything that came inside that box. Don’t get me wrong, I love, love, love my meal plan! The circumstances just aren’t conducive to mail order perishables this week. Your concern about thieves lessens because opening your windows reduces the heat in your house by 10 degrees. Ours actually dropped to 101 after we opened windows once we knew for sure the A/C was not coming back on. BTW: We adjusted our alarm and activated our motion detectors. Thieves may get in, but they won’t get out with anything. Speaking of open windows, be prepared for the giant of all hornets – the cicada killer – to find that one torn spot in your window screen to squeeze through and enter your house. It may be harmless but it seriously looks like it could carry off a chihuahua. Open windows = herds of dust bunnies. However . . . Your concern about having a tidy house dissipates because it’s too hot to clean and no one in their right mind plans to visit you. Your swimming pool is a giant hot tub. If you dare attempt to use it, you must wear flip-flops from your doorway until you reach the deep end. You will find creatures at your bird bath that you’ve never seen before – including lizards and insects. Not necessarily a bad thing. Keep your bird baths full – wild things are suffering too. Your tolerance and patience will be short with EVERYONE about EVERYTHING. Keep this in mind and, just like when coming out from under anesthesia, don’t sign any legal documents or make any important decisions for a while – i.e., after the A/C is up and running again! First of all, be prepared to lose some plants. It’s Mother Nature. No matter how often I watered this week, my once tomato-bearing, raised garden bed is toast – literally! I was not even able to take a picture of it without evidence of the sun’s hot rays blazing through. Recognize, that although it seems very odd, some plants “bolt” or flower in the most extreme of conditions. Like several of my former posts have mentioned, it is a natural reaction they have to keep their gene pool going. See bolting and recovering. Unless you are in a water restricted area, add an extra day to your lawn sprinkler schedule. Water, water, water your outdoor potted plants. Water at the base of the plants EVERY morning. Do not mist the leaves as water droplets at this time of year become tiny magnifying glasses. If movable, move your potted plants to a shady or a part shade area. If not movable, erect a temporary shade cloth tent above those plants that are showing signs of sun scald. Do it in the very early morning so as to not scald yourself. Water your indoor plants generously once a week. More so if they are wilting and you are in an un-airconditioned home. Our peace lily wilts every day but perks up after a watering in the morning. I haven’t adequately researched it, but I suspect this particular plant must be more sensitive to hot ambient temperatures. Lastly, and I know you’ve heard this before, if you lose plants this year, replace them with native species or at least with species that are well adapted to your climate and soil. It can make the difference in the life or death of a plant when dealing with extremes. For example: My husband loves azaleas and we planted about 7 of them in our front bed. They are not well suited for our area but it is possible to grow them if they are “babied” and supplemented. However, the 4 that get the most sun are not going to make it through this current heat spell. No matter how well we supplemented the soil and abided by their minimum shade requirement, the extreme heat triumphed our attempts to provide an artificial environment for them. We will replace the dwarf azaleas this fall with a shrub variety that best fits our area – most likely Indian Hawthorne. All joking aside, be sure to put yourself and loved ones first and keep cool, comfortable and hydrated in extremely hot weather. As with the hail storm we recently encountered, you can rebuild, repair, refresh and replace items when the storm (or in this case, heat wave) passes. Well, again, it has been a while since I’ve posted. I have a few interesting topics in mind to write about this summer but unfortunately this particular topic has come to the forefront due to a personal experience with baseball-sized hail recently. Living in the Dallas-Ft. Worth area my entire life (*cough* 56 years) I have been through quite a few hailstorms in my time. It seems as though the chances of baseball-sized hail or larger in our part of the country has become greater over the past several years. Keeping this in mind along with the fact homes and vehicles are greatly damaged by these storms, I thought I’d share the good news that most plants are able to recover, and some even thrive, after such events. I suppose the first step in determining if a plant will bounce back after a storm (or other disaster) is to simply give it plenty of time to heal and recover. Most people understand your landscape will be reasonably unattractive for a while after a severe event. I recall visiting Florida only a month after a category 4 hurricane had made landfall and, yes, there was major saltwater damage to all the beachfront resorts as expected. Instead of a lush welcome, we were met at our hotel by dull, brown tropicals and dismembered palms. However, I could see little pockets of healthy greenery peeking out of the dead-looking shrubs. The injured plants were already beginning to recover. Plants can be pretty resilient, just like people. And just like us humans, sometimes a plant seems A-OK immediately after an incident but a few days later the evidence of damage appears. Have you ever been in a car accident and walked away feeling fine only to literally feel like you’d been hit by a truck the next day? Then, a few days later, the bruises appear and not only do you feel like you’ve been hit by a truck but you look like it as well. The same goes with plants. There is the obvious evidence of damage such as when a full limb or palm frond breaks off, and then there is the gradual yellowing and dropping of leaves that may occur with some plants over the next few days. Still, even when pain is delayed, an injury can heal. Trim and discard dead, yellow and injured limbs, leaves and fruit. Watch closely for disease and/or insects over the upcoming weeks – both like to attack weakened plants. If disease or insects do appear, use horticultural oil (in the evening) as a remedy. Replenish the soil around the base of plants, especially if the plant was uprooted or suffered a low injury. If a tree, shrub or perennial is badly injured, resolve that it simply may not look great this year – trim it and look forward to next year. If an annual, give it a couple of weeks to show signs of recovery or new growth and if none, discard. Allow the soil to rest and look forward to planting suitable annuals/vegetables for the upcoming season (spring, summer, fall or winter). A bonus to salvaging a plant is there are times one that is severely damaged actually grows back stronger. What comes to mind right away is the old adage that a sapling left to bend in the wind grows to withstand stronger gales than those staked. In preparing for this post I read an article that mentioned scientists have discovered that select plants, nibbled to the ground by varmints, are prompted to increase their chromosomes upon re-growth after being damaged. (See https://www.futurity.org/nibbled-plants-grow-back-stronger/.) And then there are those plants, such as the moonflower vine, that must go through a catastrophe, such as a fire or flood, in order for their seeds to open, disperse and/or germinate. Speaking of reproducing, I noticed my aloe vera and pineapple plants, both which took direct hits from the hail, are suddenly developing offshoots. The mother plants may be marred for now, but soon I will have two for one! I also have noticed my doted-upon plumeria that lost all but one stalk during the storm, is producing the most vibrant fuchsia-toned blooms I’ve ever seen on its one remaining stalk (top photo). Lastly, haven’t you heard that difficult circumstances can often make fruits and vegetables more delicious? What doesn’t kill us usually makes us stronger . . . and apparently, so it goes with plants. Recently my husband and I took a quick weekend trip to East Texas to get a glimpse of what retirement might look like should we choose the area. If you haven’t had the pleasure of visiting the piney woods of Texas, it is indeed a very beautiful area and not the stereotypical flat, sparse representation of the state that most non-Texans have in their minds. While driving through a couple of developments late on Saturday afternoon, we encountered a beautiful sight – a herd of deer. As we continued through the winding roads, the sight repeated itself several times. Of course, having a great love of nature, I was very happy to see one of our potential locales for retirement included these lovely creatures. As we drove on, we stopped by a few homes on the market and began to notice most of them had dormant lantana in their flower beds. We also noticed the absence of typical winter ornamentals such as pansies, violas and cabbages. Then, the two thoughts merged and we realized living surrounded by abundant wildlife equals having limited vegetation! Well, maybe limited is a strong word. Perhaps, living surrounded by abundant wildlife means one must carefully select appropriate landscaping plants, is a more accurate statement. Keep in mind that under stressful situations, such as extreme drought or over population, deer and other wildlife will eat any plant possibly with the exception of very thorny (thus painful) shrub varieties such as hollies, barberries, etc. Thus, below should considered “less-palatable-to-deer” recommended plants. Two common themes with most of the suggested plants – they are pungently aromatic and/or have “fuzzy” leaves.